EBT Electron Beam Tomography » What is EBT? Electron beam (ultrafast) computed tomography (EBT or EBCT) is a revolutionary approach to imaging, achieving acquisition speeds over 4 times faster than the fastest helical CT equipment (which rely upon mechanical rotation of x-ray tubes).Utilizing a magnetically deflected electron beam and a stationary source-detector pair, EBT employs the latest advances in target metallurgy, vacuum science and fiber optics in order to obtain high resolution images of moving objects. Obtaining scans in 1/10 or 1/20 second, it is perfectly designed to evaluate moving structures like the heart and large surface areas (like the colon) during a single breath-hold. 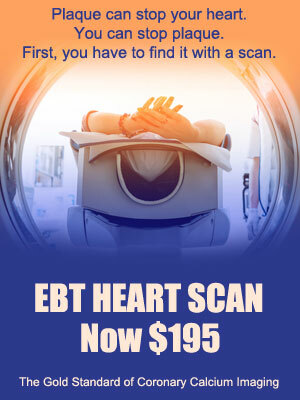 Designed originally for heart imaging, EBT has been available at major university hospitals and imaging centers worldwide for many years and is FDA approved for coronary calcium imaging, lung scanning, noninvasive coronary angiography (EBA) and CT colonography. The radiation exposure from EBT is much lower than from spiral CT examinations, especially to potentially “radiosensitive” structures in the front of the body.